Stormwater management wet ponds increase runoff temperatures in discharge waters during summer months. These increases in temperatures adversely affect receiving urban stream ecosystems. Monitoring results for three summers (2009 to 2011) from four stormwater management ponds in the cities of Guelph and Kitchener, Ontario are employed to advance our knowledge of key design parameters that influence the thermal enrichment of stormwater discharges. An artificial neural network model was developed to predict the event mean temperature at the pond outlet. The artificial neural network model explains 99% of the variability in outlet event temperature. Sensitivity analyses show that increasing the permanent pond volume from 2 000 m³ to 4 000 m³ results in an average increase of 5 °C in outlet event mean temperature. Similarly, increasing the travel path ratio from 0.6 m to 1.2 m confirmed an average increase of 6 °C in outlet event mean temperature. In addition, ponds with average depths >1.0 m can result in significant decreases in pond outlet water temperature when using bottom draw structures. The results can lead to the promotion of the design of deeper ponds with bottom draw outlets and smaller travel path ratios. However, the implications of this approach on other performance criteria should be evaluated. The following notations (Table 1) are used in this paper. Table 1 Abbreviations and definitions used in this paper. Stormwater ponds have been identified as an effective structural BMP for stormwater quantity and quality control over the past decades, and have been widely applied across many developed nations (Anderson et al. 2002). Ponds may be used to mitigate the flooding effects of uncontrolled stormwater runoff on streams as well as other purposes such as reducing contaminants and TSS. However, they may also have negative thermal effects on aquatic habitat (Herb et al. 2009). Schueler and Galli (1995) investigated a series of seven pond design configurations. They found that the thermal regimes of urban streams tend to be warmer than for undisturbed catchments. Herb et al. (2009) observed that, on average, pond outflow temperature was 1.2 °C higher than inflow temperature and, indicated that heat energy was added to the runoff from an asphalt parking lot. They also reported that the rate of heat outflow from the pond is reduced in response to reductions in ratio of the volumetric outflow rate to inflow rate; as a result, the duration of impacts increased; however, rapid changes of temperature to a receiving system were reduced. According to Van Buren et al. (2000), surface water was 3.6 °C warmer than the average temperature recorded at the bottom of the studied pond at 0.9 m in Kingston, Ontario. In this study both monitoring and modeling methods are employed to evaluate the effect of alternative SWM pond designs on stormwater pond released outflow temperatures and to estimate the water temperature at the outlet of stormwater management ponds. This was accomplished by developing and analysing an ANN model to predict the EMTO using collected monitoring data. Four urban subwatersheds with stormwater management ponds were selected for study. The sites were selected based on the accessibility and availability of design reports to collect a broad range of data for different design components. Two ponds were studied in each of the cities of Guelph and Kitchener and monitored during three summers (2009 to 2011) to calculate EMTI and EMTO. Design parameters for the ponds are listed in Table 2. It is worth noting that ponds 33 and Church were very shallow with average depths <0.5 m, while the other two ponds, 53 and 74, were deeper as shown in Table 2. Table 2 Design parameters for the selected ponds. TPR is the ratio of the most likely travel path of runoff (from inlet to outlet) to the sum of the length and width of the pond, which is idealised as a triangle (Orozco and Cleveland 2007). The monitoring program included instrumentation designs and installation tools to measure and record water level and water temperature at the inlet and outlet of each of the ponds. Water temperature sensors were installed at incremental depths. Onset and Hobo U20 level loggers as well as Pendant and Tidbit temperature probes were used to measure water levels and water temperatures respectively. Hobo software was used to compensate water level data and imported to Excel when collected data was transferred from sensors to a HOBO waterproof shuttle. Hydro meteorological data, such as air temperature and relative humidity, were obtained from the Elora Research Station and the Grand River Conservation Authority for the cities of Guelph and Cambridge respectively. Pond 33 with a contributing area of 19.4 ha is located in Guelph, Ontario. A pond inlet forebay had been constructed to retain the larger sediment particles. All flows up to the 5 y rainfall event discharge through the quality control outlet structure. Both the quality and quantity outlets from the pond discharge to riprap dispersion structures prior to discharging to a receiving system (City of Guelph Works Department 1996). Pond 53 is located in Guelph with a contributing area of 79 ha draining to Clythe Creek. The facility outlet structure consists of a fully perforated riser with an orifice plate set at different levels to release the water over a minimum of 24 h. The water quality extended detention discharge from the orifice is released to a cooling trench before entering Clythe Creek. Ponds 33 and 53, and the location for the data collecting apparatus, are shown in Figure 1. The circles represent Tidbit temperature probes and the triangles represent the location of U20 Hobo water level data loggers. Pond 74 is located at the northwest corner of the intersection of Bleams Road and Fischer-Hallman Road in Kitchener. The drainage area of the pond is 35.8 ha. Water quality and erosion control are provided through a forebay. The outlet structure discharges directly to an extension of the existing culvert. The outlet structure contains orifices intended to control the discharge from different sizes of storms. A bottom draw outlet structure allows cooler water to discharge from the bottom of the pond (MTE 2004). Church pond is located west of Strasburg Road and southeast of Huron Road in Kitchener. The drainage area for this pond is 5.14 ha. The forebay is separated from the main pond area by a berm–weir, isolating the more turbulent inlet zone from the fine particle settling and outlet zone. The water quality extended detention discharge from the orifice is released to a cooling trench. Ponds 74 and Church, and the locations of the data collecting apparatus, are shown in Figure 2. The circles represent Tidbit temperature probes and the triangles represent the location of U20 Hobo water level data loggers. Temperature probes were installed in different depth in pond 74. To develop an equation to predict the outlet water temperature of the pond as a function of inlet water temperature, the event mean temperature for both inlet and outlet is calculated using Equation 1, which was developed by Picksley and Deletic (1999). n = the event duration (number of time increments). The inflows to the pond and outflows from the pond were generated by a PCSWMM model developed to mimic the hydrologic conditions of the ponds. The pond water levels monitored during the course of the study were used to calibrate the PCSWMM model for ponds. An example of the calibrated model for pond 53 is shown in Figure 3. 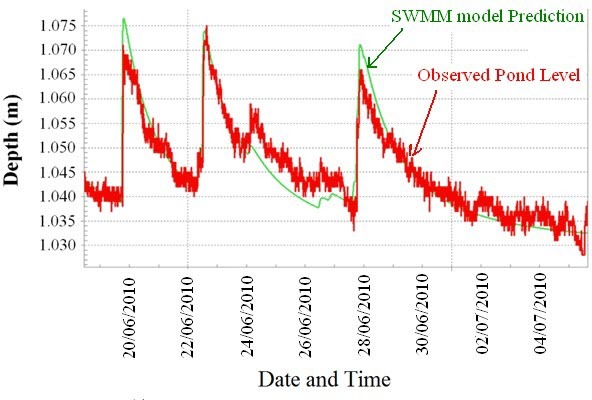 Figure 3 PCSWMM model simulations for pond 53 (predicted water level time series, red line, versus observed pond water level, green line, during the 2010-06-19 to 2010-07-05 events). Thermal enrichments for the monitored ponds are listed in Table 3 and Table 4. The EMTO differs from the EMTI by 3 °C to 10.6 °C in Table 4, and confirms the thermal effects of Ponds 33 and 53. Table 3 Ponds 33 and 53 calculated events mean temperatures (48 h drawdown time considered and event separated accordingly; difference are calculated as outlet EMT minus inlet EMT). Table 4 Ponds 74 and Church calculated EMT (48 h drawdown time considered and event separated accordingly). Pond 33 discharges water to a cooling trench from a shallow bottom draw and pond 53 discharges water to the receiving system through a perforated pipe as opposed to pond 74, which has a bottom draw outlet to direct the stormwater to an outlet manhole from the bottom of the pond at a depth of 4 m. As seen from the calculated values in Table 3, the average thermal effect of pond 74 for all events was 0.9 °C, which confirms the importance of the bottom draw outlet to mitigating the thermal effects of stormwater management ponds. However, there may be other factors, which could have contributed to the minimal thermal effect of pond 74, as compared with other ponds studied here. One identified factor is the influence of groundwater. This was suggested by the overall lower temperature of pond 74, as would be expected from a groundwater fed pond. This is also supported by observations in the MTE report (MTE 2004). The average increase in temperature (i.e. the thermal impact) of ponds Church, 33 and 53 were 3.7 °C, 7.2 °C and 5.4 °C respectively. Table 3 indicates that without the bottom draw, the thermal impacts to the receiving systems are much greater as opposed to when there is a bottom draw outlet. The minimum depth for a bottom draw outlet to be effective and compensate the warming effect of a pond (the warming effect of SWM ponds is estimated to be 5 °C according to the MOE guideline (MOE 2003) is reported as 90 cm to 120 cm (Sabouri et al. 2013). The significant difference (~5 °C) in water temperatures is observed between the surface water temperature and that of depths between 90 cm and 120 cm. Figure 4 presents water temperature profiles during the 2010-08-02 to 2010-08-05 dry weather, highlighting the effects of depth on water temperature. The largest decreases in water temperature occur when depth increases from 0 m to 1.2 m. Therefore ponds deeper than 1.2 m would benefit the most from discharging cooler water. 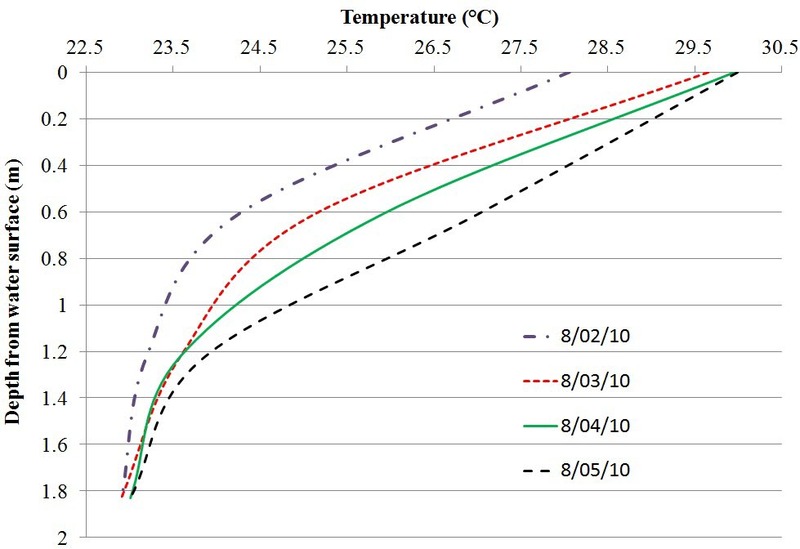 The peak for water temperatures is estimated to happen at 15:00 according to the observed collected water temperature data; accordingly, water temperatures at 15:00 are used to create the water temperature profile presented in Figure 4. Figure 4 Pond water temperature profiles during the 2010-08-02 to 2010-08-05 dry weather. ANNs have been successfully used in the discipline of hydrology and water resources to model relations such as rainfall runoff processes, the prediction of daily stream flows, and forecasting water quality parameters (e.g. Chen and Chang 2008; Kumar 2012). This study makes use of the ability of an ANN for mapping complex nonlinear relations to approximate the pond’s outlet water temperature for rainfall events. Several types of ANN exist, of which the most popular is the feed-forward multi-layer perceptron which is used in this study. In order to choose the input variables to develop the ANN model, key storm events and pond design parameters are considered and named case 1 as shown in Tables 5 and 6. Key storm event variables include depth of rainfall (R, mm), event mean temperature for rainfall (EMTR, °C), event mean temperature for runoff at pond inlet (EMTI, °C); and pond design parameters consist of travel path ratio (TPR), pond volume (VOL, m³), and average pond depth (d, m). The surface area of the pond is not included since it can be calculated using two other parameters (VOL and d), and the surface area of the pond is not an independent variable in the model. All mentioned variables were used to develop an ANN in which EMTI and TPR were found to have greatest relative importance in the developed model for predicting the EMTO (case 1). Furthermore, other cases of ANN were developed by eliminating those parameters which had smaller relative importance according to sensitivity analyses. Table 5 illustrates the level of importance of variables used to develop ANN models. In all cases the model is most sensitive to EMTI; the next levels of importance belonged to TPR, EMTR, VOL, R and d, respectively. Table 6 shows all the input parameters for developed ANN models used to predict EMTO. Table 5 Relative importance of the variables. The ANN software Tiberius (Brierley 2007) was used to train the data. Several networks were trained using the input drivers identified in Table 4 in order to predict the EMTO. The ANN models were trained using seven hidden nodes. Five cases were identified to develop ANN models to predict EMTO. Case 1 input variables included EMTI, TPR, EMTR VOL, R and d. Variables showing the lowest level of importance in each case were omitted (according to statistical analyses) and other cases (2 through 5) were created and used to develop the ANN models. An exception, however, goes to case 4, since design parameters (TPR, VOL and d) are excluded to determine the effect of these parameters. Table 6 Input parameters for developed ANN models to predict EMTO. A comparison of predicted EMTO versus observed EMTO values between case 1 and case 4 is illustrated in Figure 5. When comparing the results of all trained ANNs with the calibration set, R² varied from 0.99 to 0.62, which demonstrates a good level of accuracy of prediction. 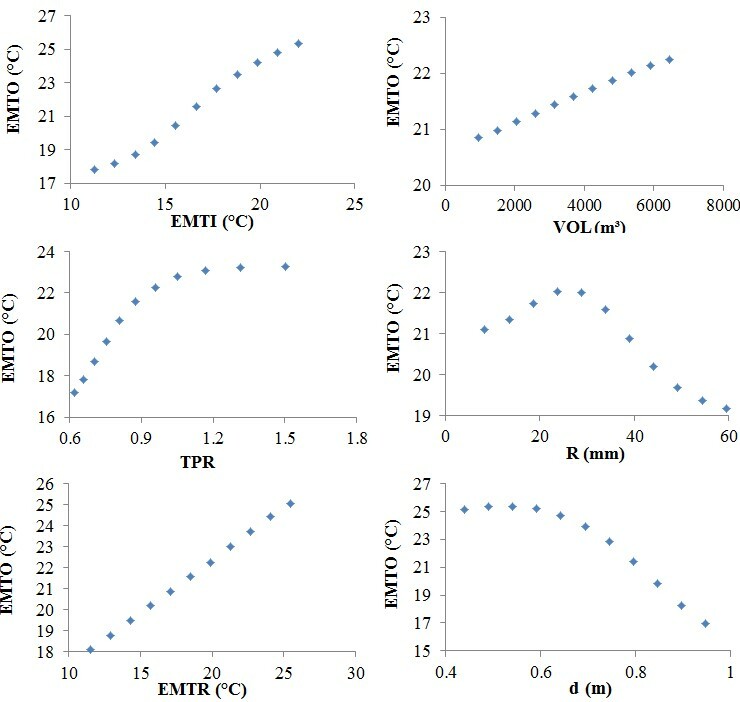 Shown in Figure 5 are the results of the ANN prediction of EMTO presented for case 1 and case 4, which have different numbers of input parameters. In the first case, there are six input parameters: EMTI, TPR, EMTR, VOL, R and d. Moreover, the developed model has R² = 0.99. In the second case, the model developed with d omitted shows R² = 0.85. The third case was developed using four variables, which were EMTI, TPR, EMTR and VOL has R² = 0.65. In case 4, an ANN model was developed using only three input variables (EMTI, R and EMTR) which are not design parameters, and R² = 0.77 is obtained for this model; and the fifth case was developed using two inputs (EMTI and TPR) with R² = 0.62. The six parameter model was able to explain 99% of the variability in the observed mean event temperatures at the pond outlet. The three parameter model could only account for 77% of the variability. However, the difference shows that TPR, d and VOL, which are design parameters, account for 22% of the variability in the predicted EMTO. The design parameters (TPR, d, VOL) are controlled by the design’s engineer, who could therefore govern and improve the construction strategy of the facility. The ANN model (case 1) consisted of six inputs and seven hidden nodes. About 70% of the data were randomly selected for the training of the network and the remainder were used for testing the accuracy of the model. Table 7 illustrates the coefficients and different statistical measures for the ANN model evaluation and their range of variability. Table 7 Statistical measures for model evaluation and their range of variability (Oi and Pi are observed and predicted values respectively). Statistical performance of the ANN model (case 1, with 6 input parameters) for both the training as well as for the testing data sets are summarized in Table 8, showing the ANN performance for case 1 to train and test the prediction of EMTO. Table 8 Statistical performances of train and test value. Figure 6 presents the sensitivity analyses of the trained ANN model; this analysis revealed that increasing pond volumes from 2 000 m3 to 4 000 m3 resulted in an average increase of 0.5 °C in the EMTO, assuming all other factors remain constant. The rate of solar radiation absorbed by the pond is related to pond surface area. Since pond volume and pond surface area are highly related, it is most likely that increasing the volume of the pond and providing more surface area that is exposed to solar radiation will result in an increased EMTO. In addition, increasing the travel path ratio from 0.6 to 1.2 resulted in an average increase of 6 °C in EMTO. Both larger volume ponds and ponds with elongated travel paths tend to discharge more of the warmer water that has been sitting in the pond, rather than the cooler runoff water from a fresh event. Sensitivity analysis of the ANN model indicates that increasing average pond depth from 0.6 m to 1.0 m in the model (keeping the other variables constant) results in a decrease of up to 8 °C in EMTO. Figure 6 ANN model sensitivity analysis of EMTO to pond key design parameters. Furthermore, from sensitivity analysis of the developed model, most likely increasing EMT of the rainfall by 1 °C tends to increase EMTO by 0.5 °C; similarly, every 1 °C increase in EMTI resulted in almost 1 °C increase in EMTO in the ANN model as shown in in Figure 6. Finally, sensitivity analysis of rainfall magnitude revealed that the first 25 mm of rainfall has a warming effect on EMTO and excess rain >25 mm caused EMTO to be reduced. Increasing rainfall from 25 mm to 60 mm in the developed ANN model, while keeping other variables constant, resulted in 3.4 °C decrease in EMTO as shown in Figure 6. A new approach has been proposed to predict outlet event mean temperatures of stormwater management ponds using artificial neural networks. The ANN model which was trained using monitoring data explains 99% of the variability in the EMTOs. The input variables to develop the ANN were chosen based on two categories that consist of key storm event parameters (EMTI, EMTR and R) and design parameters (TPR, VOL and d). In the late spring and summer months, water that is sitting in the typically shallow wet ponds is generally warmer than fresh event runoff entering the pond. The average EMTO was 5.4 °C warmer than the average EMTI for the monitored storms. In addition, sensitivity analysis of the ANN model confirms the linear relationship of EMTR and EMTO, which shows warmer rainfalls tend to release more warm water to the outlet and receiving system. Concerning key design parameters of stormwater ponds, larger permanent pool volumes tend to release the warmer water resident in the ponds. Increasing the travel path ratio by using baffles can lead to less mixing of the water that is resident in the pond with the cooler fresh event runoff and therefore an increase in EMTO. Thus larger volume ponds and ponds with elongated travel paths tend to discharge more of the warm water that is sitting in the pond rather than the cool fresh event runoff, especially for events with magnitude >25 mm. However, increasing the average pond depth in the model results in a decreasing EMTO; therefore the design of ponds with average depth >1 m has a significant influence on decreasing EMTO when bottom draw structures are implicated. The effects of this approach on other performance criteria, such as the removal efficiency of contaminants, as well as effluent temperature should be evaluated. Anderson, B., W. Watt and J. Marsalek. 2002. “Critical Issues for Stormwater Ponds: Learning from a Decade of Research.” Water Science and Technology 45 (9): 277–83. Chen, Y. and F. J. Chang. 2008. “Evolutionary Artificial Neural Networks for Hydrological Systems Forecasting.” Journal of Hydrology 367:125–37. City of Guelph Works Department. 1996. Design Principles for Storm Water Management Facilities. Guelph: City of Guelph Works Department. http://guelph.ca/wp-content/uploads/Design-Principles-Stormwater-Management.pdf. Herb, W. R., O. Mohseni and H.G. Stefan. 2009. “Simulation of Temperature Mitigation by a Stormwater Detention Pond.” Journal of the American Water Resources Association 45:1164–78. Kumar, B. 2012.” Neural Network Prediction of Bed Material Load Transport.” Hydrological Sciences Journal 57:956–66. MOE (Ontario Ministry of the Environment). 2003. Stormwater Management and Design Manual. Toronto: Queen’s Printer for Ontario. Nash, J. E. and J. V. Sutcliffe. 1970. “River Flow Forecasting Through Conceptual Models: Part 1—A Discussion of Principle” Journal of Hydrology 10 (3): 282–90. Orozco, S. and T. Cleveland. 2007. “Evaluation of Travel Path Ratio as a Measure of Short-Circuiting Potential in Stormwater Quality Basins Using Ideal Flow Modeling.” World Environmental and Water Resources Congress 2007:1–15. doi:10.1061/40927(243)577. Picksley, J. W. and A. Deletic. 1999. "The Thermal Enrichment of Storm Runoff from Paved Areas: a Statistical Analysis." Journal of Water Management Modeling 07: R204-07. doi: 10.14796/JWMM.R204-07. Sabouri, F., B. Gharabaghi, N. Perera and E. A. McBean. 2013. "Evaluation of the Thermal Impact of Stormwater Management Ponds." Journal of Water Management Modeling 21: R246-12. doi: 10.14796/JWMM.R246-12. Schueler, T. R. and J. Galli. 1995. “Environmental Impacts of Stormwater Ponds.” Chap. 11 in Stormwater Runoff and Receiving Systems: Impact, Monitoring, and Assessment, edited by E. Herricks. Boca Raton, FL: CRC Press/Lewis. Van Buren, M., W. Watt, J. Marsalek and B. Anderson. 2000. “Thermal Balance of On-Stream Stormwater Management Pond.” Journal of Environmental Engineering 126:509–17. Willmott, C. J. 1984 . “On the Evaluation of Model Performance in Physical Geography.” In Spatial Statistics and Models, edited by G. L. Gaile and C. J. Willmott, 443–60. Boston: Reidel.